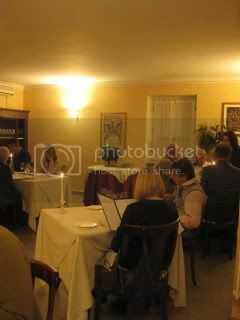 On the final evening in Piemonte, we had a “wrap” dinner at Antine Ristorante in Barbaresco. 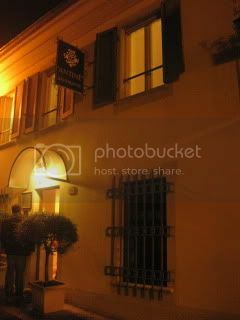 It is one of the most “formal” style restaurants in the region. Yet, it’s a wine region, so their “formal” is un-stuffy smart-casual style. 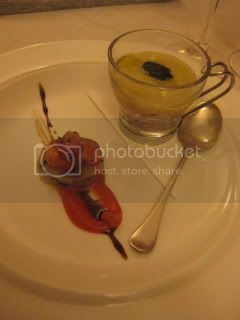 Little starter plate with a glass of Prosecco was served to everyone from the restaurant. It was river fish (trout?) marinade with tomato sauce, and calamari with broccoli sauce and caviar. They don’t have any seafood on their menu (no surprise, because we are in Piemonte), so this was the only seafood of the night. 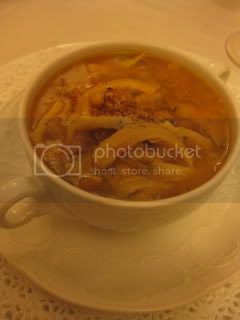 My antipasto was Zuppetta di Verdure e legumi secchi con la trippa (tripe and bean soup). 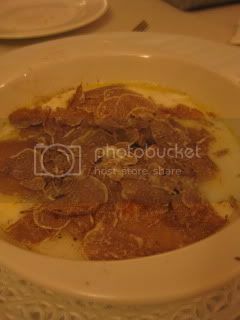 Traci had the outstanding local egg dish, with shaved white truffles which covered the whole surface. Egg yolk was so orange. The combination of the flavors really great. Steve’s veal tongue salad was nice, too. Lynne’s tonnato was the most fancy-looking tonnato I saw in this trip. 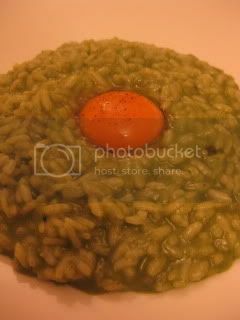 Primi…I had Risotto del vercellese mantecoto in verde di spinaci, robiola fresca di Langa e tuorlo d’uovo crudo (risotto with spinach & fresh robiola sauce, and raw egg yolk). 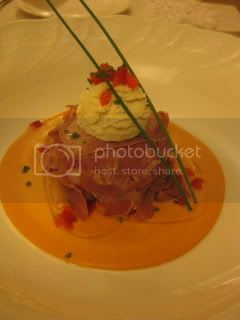 This was the winning dish of the night! 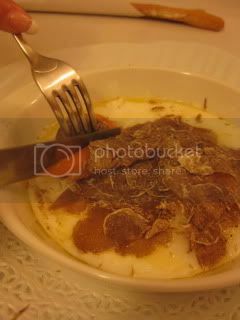 For me, it was Italian version of “tamago-kake gohan” (raw egg over rice), and the flavor was amazing. 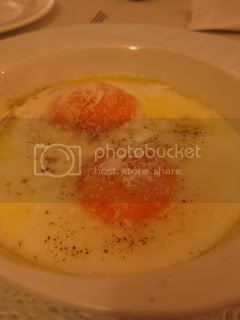 The yolk of the local egg was so rich and brought the multiple richness effect with the creamy risotto. 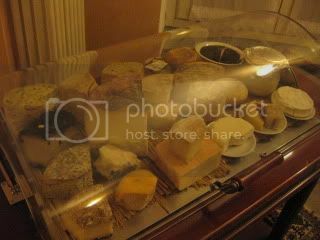 Wow…but, it was so rich that I couldn’t finish it, and I got so full already. 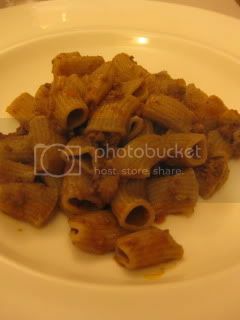 Other friends’ pasta dishes were nice, too. 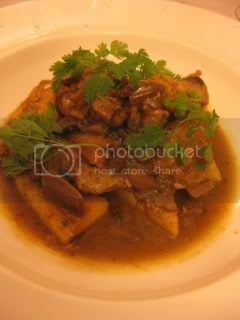 Secondi…Faraona di cascina a tocchi brasata in tegame con funghi (guinea hen with mushrooms). The flavor was good, but I was already too full to really enjoy the dish. 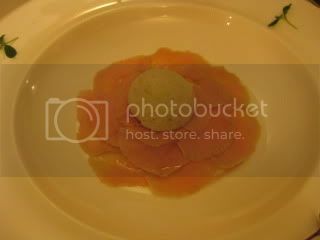 This dish was super-rich, too. 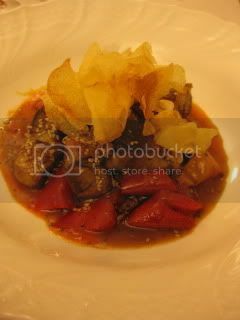 Steve’s veal belly stew was another very rich dish. 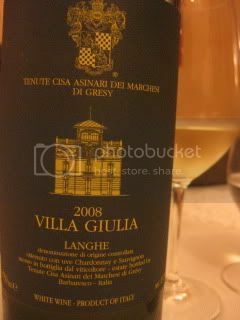 Wines…2008 Tenute Cisa Asinari dei, Langhe, “Villa Giulia”…Blend of Chardonnay and Sauvignon Blanc from Barbaresco. 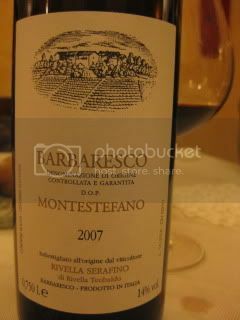 2007 Rivella Serafine(Rivella Teobaldo), Barbaresco, “Montestefano”…Teo’s wine! 2007 was so ready to drink and it was like Bourgogne-like smooth. 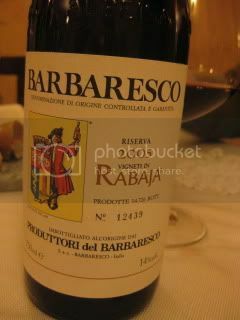 2005 Produttori del Barbaresco, Barbaresco, “Rabaja”…chestnut like tannins. Big Barbaresco. 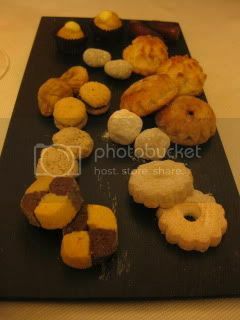 I was too full to do the fromaggio course on the final night in Piemonte. It was a nice final evening with my 4 travel buddies. Thank you, everyone. Some of them were scheduled to go back to LA the next day, one of them was going to Campagna, and I would leave for Switzerland.